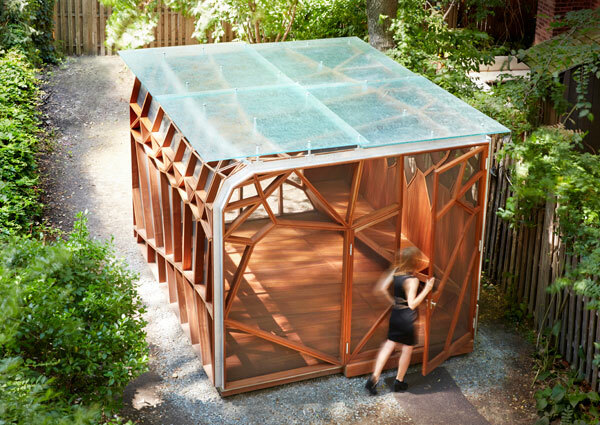 The Dragonfly Pavilion is situated in a long rectangular garden behind a four-story townhouse in Hoboken, New Jersey. Pavilion is Latin for Papillion or “butterfly.” Drawing from the complex structural pattern of butterfly and dragonfly wings, our team came to understand that the pattern was not merely ornamental, but highly efficient: its intricacies are created by its form. 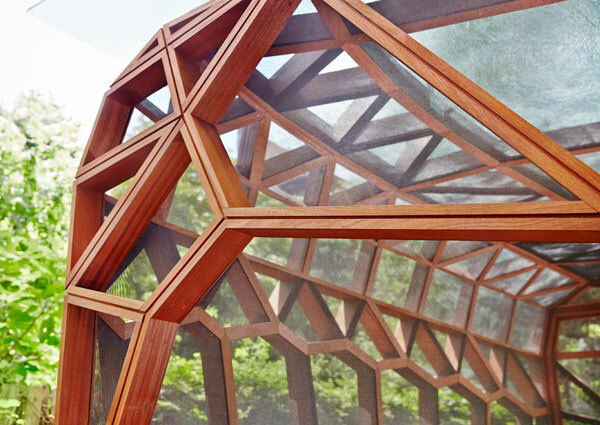 The skeletal structure of the Pavilion is a gradient of complex geometric shapes. 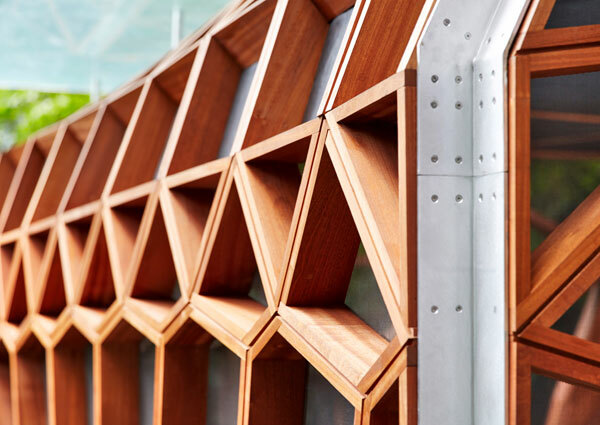 The entirety of the Pavilion is an assembly of irregular cells shaped by local stresses, constructed of sustainably harvested and FSC-certified Sapele mahogany and stitched into a vertical recycled aluminum vertical armature. These cells are more than just aesthetically appealing; their shape and size respond directly to the forces acting on it. 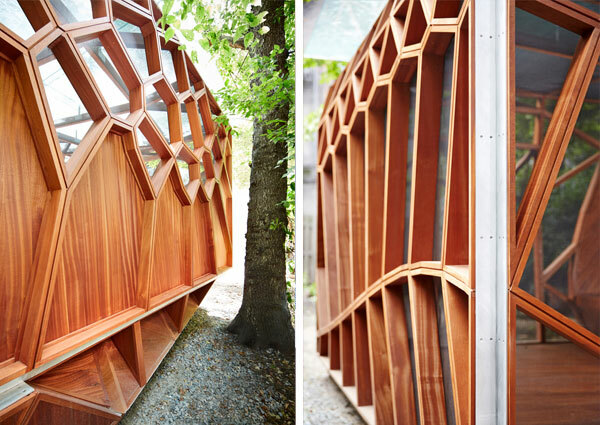 The Pavilion is a simple rectangular form creating an inhabitable threshold from a deck on one side of the townhouse through to a more privatized garden space on the other side. The project is the result of a commission for an outside porch that provided shade and protection from wildlife. The client has a sensitivity to insects, so special screening was necessary to fill the mahogany cells; also giving the visual depth of an inner skin. 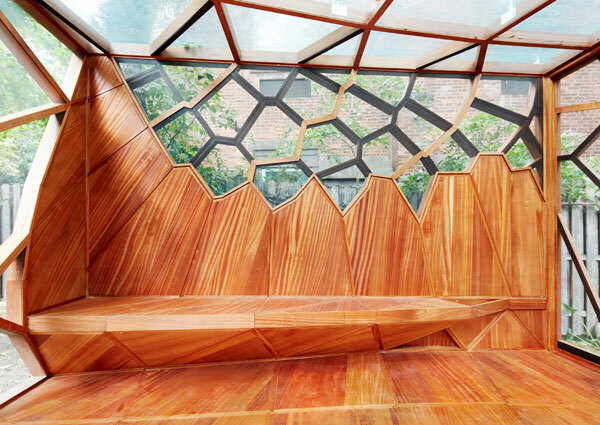 The structure supports a glass canopy which is made from a patterned, laminated-tempered glass, allowing light to come through, while still providing privacy due to its water-like pattern. 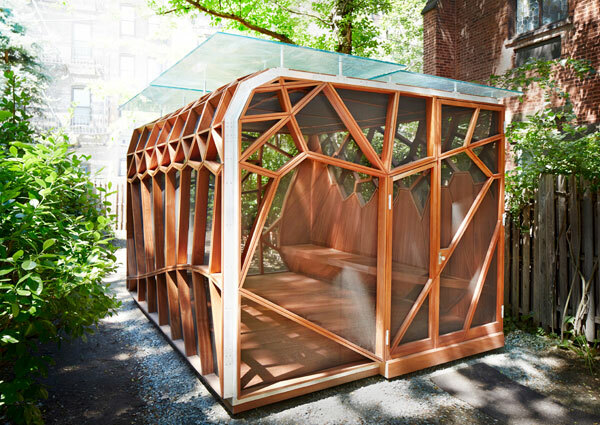 The resulting space provides a sheltered outdoor experience, with space for yoga, dining, reading, and outdoor sleeping. 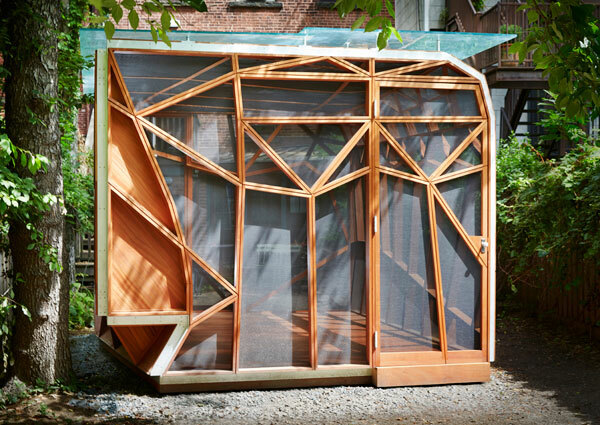 In designing and constructing the Pavilion, computer-aided design and manufacturing enabled a significant amount of digital fabrication, specifically at the level of detail while creating a more efficient design and construction process. An algorithm for generating a specific pattern was developed from the wing structure. Ultimately a digital model was used to communicate with the client as well as the fabricator. The fabricator was able to use this model to make tweaks during the fabrication process. This flexibility returns the possibilities of fortuitous dialogue not usually available on projects. The process was open yet saved time as well as prevented field errors. Once the manufacturing model was pre-fabricated, it was assembled in a warehouse, taken apart, and then reassembled on-site. The entire installation process took less than one week.